You are here: Home / Images / Pretoria Image: interior. hans christian hansen, architect: tagensbo kirke / church, copenhagen 1966-1970.
tagensbo church and kindergarten, landsdommervej 35, copenhagen NV. architect: hans chr. hansen 1901-1978 (working in his own name). tagensbo is a box full of surprises, one of them being that it may not be with us for much longer. let me make a case for it while it is still here. in some ways the church is as cool and abstract as hans chr. hansen’s other late works, but in the interior his values become apparent by how he dealt with the conventions of church building. what we meet is hansen’s critical humanism, his historical awareness, and a certain warmth expressed in how he brought people together. these could really only be guessed at from his many technical facilities, but were evident in his earlier institutions with their restless sections and general eventfulness. there is nothing remotely eventful about hansen’s final buildings. in tagensbo, a rectangular section meets a rectangular plan and a shoebox is born. knowing the mischief hansen was capable of when working in the section makes you wonder if his extreme economy of means was not the result of an extreme economy to begin with. a 1966 reform which had taxpayers foot the bill of new churches must have come too late by only a few months, making tagensbo one of the last projects to be financed by donations through the independent copenhagen church fund. the tax reform was later to provide spreckelsen and utzon with sufficient means for their great churches, but perhaps the people of tagensbo would rather have their freedom. I have been told there was controversy in the christian press at the time, but I am not sure what controversy in the christian press counts for. they got a box and our study is what hansen did with it. interestingly, in the light of so much of current architectural thinking, he did not employ the manipulation of form; his box stayed a box. rather, we should look at his work as the manipulation of type. the easy and traditional answer would have been for hansen to organise the church lengthwise. this tried and tested plan dates from the early christian adaption of the roman basilica as their house of worship. you know you are winning when you are able to reinterpret the meaning of one of the main building types of the roman empire, but its past was not easily overcome, perhaps because the past was part of its allure. the basilica had been a throne room and a courthouse, with roman dignitaries positioned in the apse. I imagine it made perfect sense during those final chaotic years of the western empire when christianity had become the state religion and the country was falling apart. there is a fifth century church in rome in which christ is depicted in the half-dome of the apse as a roman senator, carrying the law in his hands, passing judgement on the believers. a throne room and a courthouse – a fitting choice for the romans, but a troubled choice for christianity. in fairness to the catholics, they did well by it for centuries, but the catholic church had become a repository for roman culture since the crisis of the fifth century had coincided with the christening of the roman nobility. men wearing dresses, hoarding wealth, art and knowledge in their stone basilicas, speaking latin long after the rest of the world had ceased to, keeping women at a distance and buggering their choirboys instead – it was all very classical, but except for the suppression of women it had little to do with scripture. catholicism also preserved roman hierarchies that were effectively mirrored in their symbolic throne rooms and courthouses. when the reaction came, a fanatical return to scripture instigated in northern europe, the buildings had to change too. there is every reason to be cynical about money in construction as in any other aspect of life, and there can be no doubt that the new, improved and impoverished church of protestantism also needed a cheaper way to build its houses. german protestants came up with a remarkably simple solution, a single-room church on a rectangular plan, no aisles and a flat ceiling. architecturally speaking, it had very little going for it but for one brilliant move: the preacher and his congregation faced each other across the short length of the space, bringing the spatial experience of going to church closer to that of the study group, if you’ll allow the anachronism, and deflating the position of the priesthood. 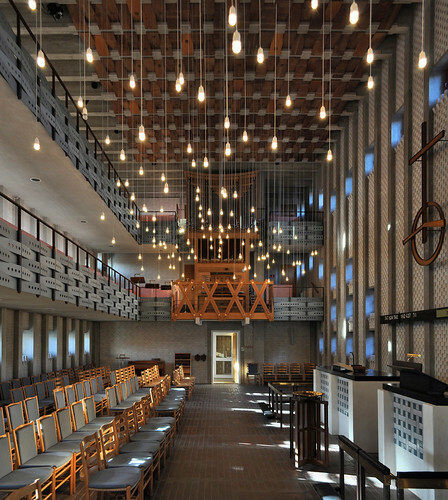 the inherent critique of the roman basilica and what it brought to christianity has had a long afterlife in the 20th century – around copenhagen it can be seen in the more neutral square plans applied by the exners, von spreckelsen, utzon and in lewerentz’ final church in klippan. hansen did not follow their lead but went straight to its protestant roots and developed his design from there. the measurements of his church were tied to the geometry of the surrounding housing blocks and their shallow depth made for an even greater intimacy and intensity, but rather than compensating for this hansen emphasised it by adding two open U-shaped galleries that hug the space and bring about some of the qualities of a shakespearean theatre, not least that of the crowd witnessing its own reactions. the galleries are likely to be empty except for the greatest events of the church year, christmas and easter, and for weddings, funerals and baptisms, but those are exactly the occasions when hansen’s touch of theatre makes the most sense. the protestants had originally kept the central processional route towards the altar in their new churches , but it was short, and too short processions have since been a problem of the various modern churches on a square plan. we remain sentimental of walking our young and our dead down the aisle and rightly blame the architect when the possibility is taken from us. hansen’s finest idea, to my mind, was to keep the processional route and to place it perpendicular to the line of sight. you carry your babies, your bride and your parents in front of the congregation, your friends and family, and sit them down not at the top of the room but at its centre. and there it is, the warmth and humanity of this otherwise cool and somewhat abstract building – the ability to see and shape its rituals from the point of view of the man or woman walking through the door rather than the institution that happens to pay for the electricity. it was a lesson learned from that great father figure of nordic architecture, erik gunnar asplund, who was as important to hansen as he was to anyone who had begun their career during the 1920’s, the height of asplundian classicism in scandinavia. we are best served by sticking to classicism, hansen is quoted as saying. we are best served by sticking to asplund was likely what he meant. hansen’s sensitivity is also seen in the surprisingly small windows. anything larger would have created glare, he correctly judged, once people were facing the long facades. the impressionist forest floor of sun spots was no doubt a welcome effect as well. the many lightbulbs are a recent addition, borrowed from the ‘starry skies’ of exners’ churches. they are not without charm. part of me sees a connection with the sun spots from the small windows and likes it, part of me finds that some of hansen’s analytical clarity is lost. what it adds, though, is an invitation; an invitation to the laity, the general user, reader, listener, that all of modern art needs, but so little of modern art offers. the relationship between frame and cladding, skin and bones, as it is unfolded inside the church is of particular interest. hansen offers a playful, almost light-hearted weave of cheap industrial materials: painted plywood in quaint colours, white calcium silicate bricks and dark floor tiles are set against neutral, almost silent frames of concrete and steel. patterns related to textiles and weaving are found in the floor, the ceiling, the balcony fronts and the infill brickwork of the northern wall. even the antependium, the altar cloth, is replaced with a ceramic representation of a woven fabric, making it the primary motif of the interior. as most of you will know, the theme of frame and cladding is central to many of hansen’s mature buildings, often developed in very different ways, with his staccato rhythm of densely spaced verticals as a uniting trait. the recurring reference to textiles in tagensbo, even down to their representation in ceramics, suggests that hansen was studying the first and most important theoretician on the question of cladding or bekleidung as he would have called it. gottfried semper, a 19th century german architect and art historian, advanced the idea that the true origin of architecture, its urkunst, was found in the rich woven textiles that still make up the temporary dwellings of nomad peoples. I don’t know who reads semper these days, but you’ll recognise his influence in the writings and interiors of adolf loos who once said, I believe, that he began a particular room with carpets on all surfaces and only then looked for a structure to support them. semper, though long dead, played an important part in early modernist architecture, his book der stil even lending its name to a dutch avantgarde movement, but we haven’t seen or heard much of him in Danish architecture. tagensbo could be viewed as the exceptional example of semperian tectonics in copenhagen, worthy of academic study on this account alone. apart from the antependium, the altar itself is a study in modesty, brickwork supporting a black plywood table top. this is for the jesus who was born into the construction business, the carpenter’s son. it is not conventionally beautiful, but very assured nevertheless. now, some of you are thinking, why have you not shown us this house before? admittedly, its grim facade made me hesitant when I did the first run-through of hansen’s works. I wanted you to like him as much as I did. but others have worked tiredlessly to bring attention to tagensbo church, if not the kind of attention it deserves. in 2012, it was placed on a list of sixteen copenhagen churches to be deconsecrated and sold. the list came with a review from our architect to the crown, jens bertelsen of bertelsen & scheving. his ruling was as heartbreaking as it was wrongheaded: a decommissioned tagensbo church was not worth protecting, and you could easily fit an extra floor in its central space without compromising any qualities it might contain. are you now feeling what I felt when I read this? am I alone? the question was temporarily resolved when tagensbo announced that the parish alone held the authority to close its church, and that they weren’t going anywhere. I so like the fighting spirit of their response, but I also remember when one member of staff quietly told me that they were down to twenty old ladies and that they even failed to show up at the same time. one way or the other tagensbo is on borrowed time. this is what I mean when I say that hansen’s buildings are under threat: it is not a lack of christians that will do them in, it is a lack of recognition. only when we see them for what they are worth, will people want to keep them even after they lose their original purpose. if it survives, perhaps tagensbo could one day be a mosque, who knows; its working class neighbourhood has changed its faith long ago. I called the good people at our national museum to hear what they thought of the house, as they will no doubt have a say in its future when the twenty old ladies holding it up give in. thankfully, they know it well and see it as unique and worthy of protection. there is hope still. don’t copy texts and comments. respect the photos that are marked all rights reserved. for photos with a CC license, please name photographer "SEIER+SEIER".